The Wisdom of the Chinese Kitchen, with its 150 recipes culled from a lifetime of family meals and culinary instruction, is much more than a cookbook. 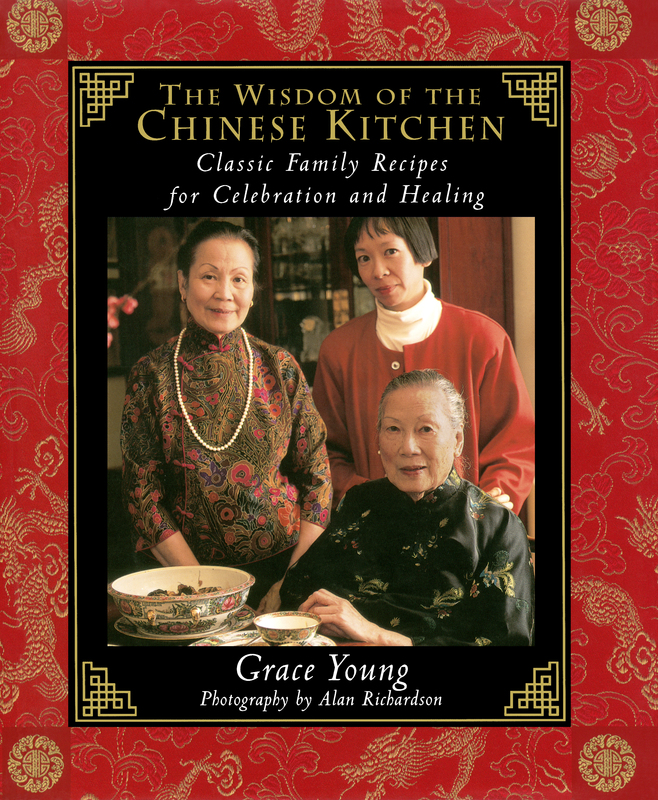 The Wisdom of the Chinese Kitchen is a daughter's tribute—a collection of personal memories of the philosophy and superstitions behind culinary traditions that have been passed down through her Cantonese family, in which each ingredient has its own singular importance, the preparation of a meal is part of the joy of life, and the proper creation of a dish can have a favorable influence on health and good fortune. Each chapter begins with its own engaging story, offering insight into the Chinese beliefs that surround life-enhancing and spiritually calming meals. In addition, personal family photographs illustrate these stories and capture the spirit of China before the Revolution, when Young's family lived in Canton, Shanghai, and Hong Kong. The first part, “Mastering the Fundamentals,” provides instruction on the arts of steaming and stir-frying; the preparation of rice, panfried, and braised dishes; the proper selection of produce; and the fine arts of chopping and slicing. Part Two, “The Art of Celebration,” concentrates on the more elaborate, complex, and meaningful dishes—such as Shark's Fin Soup and West Lake Duck—that are usually made with rare ingredients, and sweets such as Water Chestnut Cake and Sesame Balls. The final part, “Achieving Yin-Yang Harmony,” explores the many Chinese beliefs about the healing properties of ginseng, gingko nuts, soybeans, dong quai, and the many vegetable and fruit soup preparations that balance and nourish the body. The stories and recipes combine to demonstrate the range of Cantonese cooking, from rich flavors and honored combinations to an overall appreciation of health, well-being, and prosperity. In addition to the recipes, Young provides a complete glossary of dried herbs, spices, and fresh produce, accompanied by identifying photos and tips on where to purchase them. Unique traditional dishes, such as Savory Rice Tamales and Shrimp Dumplings, are also illustrated step by step, making the book easy to use. The central full-color photo section captures details of New Year's dishes and the Chinese home decorated in celebration, reminding one that these time-honored traditions live on, and the meals and their creation are connections to the past. In Chinese cooking, every ingredient and dish is imbued with its own brilliance and lore. When I was a young girl growing up in a traditional Chinese home in San Francisco, this knowledge was passed on to me through a lifetime of meals, conversations, celebrations, and rituals. I felt every food we ate in our home had a story. "Eat rice porridge, jook," Mama would say, "so you will live a long life." Or, "Drink the winter melon soup to preserve your complexion and to cool your body in the summer heat." Early on, my brother Douglas and I observed that the principles of yin and yang -- a balance of opposites -- were integrated into our everyday fare. For example, vegetables considered cooling, such as bean sprouts, were stir-fried with ginger, which is warming. Or stir-fried and deep-fat fried dishes were eaten with poached or steamed dishes in the same meal to offset the fatty qualities of the fried dishes. After a rich meal special nourishing soups were served to restore balance in the body. Today, the brilliant harmony of Chinese cooking is gaining recognition. Chinese cuisine uses spare amounts of protein and a minimum of oil. Carbohydrates comprise essentially 80 percent of the diet and, in Southern China, this is primarily vegetables and rice, a nonallergenic complex carbohydrate that is one of the easiest foods to digest. Herbs and foods like ginseng, soybeans, gingko nuts, and ginger, which the Chinese have integrated into their diet for thousands of years, are now being accepted by the West as particularly beneficial for health. Many of the vegetables in the Chinese diet, especially greens like bok choy, are rich in beta carotene, other vitamins, phytochemicals, and minerals, and the favored technique of stir-frying preserves the vegetables' nutrients. My parents have impressed upon me their love of food as they had learned it in China. l grew up to appreciate every aspect of cooking, from shopping to preparation to the rituals of eating. This lifelong influence led me to my career as a food stylist and recipe developer. My father, Baba, often warned Douglas and me about certain foods. Chow mein and fried dim sum, he said, were too warming, yeet hay, or toxic, if eaten in excess. On the other hand, most vegetables and fruits were cooling, leung, and therefore especially good to eat during the summer. He never actually explained to us precisely what "too warming" or "too cooling" meant but, somehow, we accepted it and allowed that he was right. Still, my brother and I listened to our parents' stories with only half an ear. When Mann served Dried Fig, Apple, and Almond Soup and reminded us that it was "soothing for our bodies, yun," we didn't really care. Instead, we could hardly wait to sink our teeth into a pizza, a hamburger, or a Swanson chicken pot pie, foods that we somehow knew were yeet hay, but were too much a part of the all-American life we led outside our home that we craved them anyway. My family's kitchen was often fragrant with the aroma of homemade chicken broth simmering on the back burner of the stove. Invariably, bok choy was draining in a colander, while a fresh chicken hung on a rod over the counter to air-dry briefly before it was braised or roasted. Instead of boxes of commercial cereals, our kitchen cupboards were filled with jars of indigenous Chinese ingredients like lotus seeds, dried mushrooms, various soy sauces, cellophane noodles, and curious-looking herbs like ginseng, red dates, and angelica, or dong quai. Instead of milk and butter (dairy products are not part of Chinese cuisine), our refrigerator shelves were more likely to have tofu, ground bean sauce, ginger, and lotus root. In the pantry sat a 100-pound sack of rice. Like many first-generation Americans, I didn't give my culinary heritage much thought until I was well into adulthood. Growing up in San Francisco, I ate Cantonese home-style food every day. These were not dishes found on restaurant menus, but rich, savory dishes with pure, simple flavors that are the hallmark of a home cook. Whether it was a simple weeknight supper or a more elaborate weekend meal, my parents wanted us to know why, in all of China, the Cantonese were considered to be the best cooks. Their cuisine is the most highly developed -- it has the broadest range of flavors, yet the subtlest of tastes. Later I would learn that the concept of foods having "warming" and "cooling" characteristics is especially revered by the Cantonese and manifests itself in their cooking. All the special soups we drank for nourishing and harmonizing our bodies came from a distinctly Cantonese tradition, one not found in any other part of China. On my visits to San Francisco, Mama's delicious cooking stirred my taste memory, and I began to notice how much healthier I felt after several days of home cooking. As I began to record my family's recipes, I realized there were huge gaps in my knowledge, having learned Chinese cooking only through casual observation and not from formal study. Even with my professional cooking experience and natural familiarity with Chinese cuisine, it required energetic detective work to decipher and understand some of the recipes. For Chinese cooking is as ancient as its culture, with layers of meaning and wisdom that cannot be easily explained. No one member of my family could teach me every recipe or answer all my questions. I acquired most of my knowledge from my parents, but relatives and family friends all offered little bits of information that I pieced together. The power and wisdom of Chinese cooking goes far beyond simply mastering the more complex cooking techniques or even knowing the ingredients. For me, the principles that govern Chinese cooking and nutrition are far more intriguing than the Western notions of nutrition, with its focus on cholesterol, vitamins, minerals, fiber, carbohydrates, protein, and fits in the diet. It is a cuisine based on opposites, the yin-yang principles of cooking. This philosophy is so instinctively ingrained in my family that it was hard for them to articulate it verbally. I recognized that if I didn't begin questioning my parents, grandmother, aunts, and uncles, the wisdom of their diet and the lore of our culinary heritage would be irretrievably lost. It became clear that I needed to look to the past to understand the present. I recorded my family's recipes without Americanizing the ingredients. There are those who offer substitutes for traditional Chinese ingredients, but this fails to acknowledge the genius of Chinese cooking. There is a reason for thousands of years of reverence for certain combinations. Recipes that offer, for example, Kentucky string beans as a substitute for Chinese long beans fail to grasp the Chinese nutritional perspective. While both vegetables have a similar crunchiness and might seem comparable, the Chinese long bean is the only vegetable the Cantonese consider neutral, neither too yin, "cooling," nor too yang, "warming," and is the only vegetable women are allowed to eat after giving birth. Cantonese believe most vegetables and fruits are "cooling" and, therefore, dangerous for a new mother, especially in the first month after she gives birth. The recipes in this book include some that do not require exotic Chinese ingredients. Not every dish needs a specialty ingredient of labor-intensive chopping and shredding but, in all truthfulness, if you genuinely desire to cook Chinese dishes, you will need exotic ingredients, along with the time to properly prepare them. Some cooks will suggest using canned water chestnuts in place of fresh, but it is my feeling that if fresh are not available, the recipe is not worth making. For me, using canned water chestnuts is like using canned potatoes. In some areas, I've simplified recipes by calling for the food processor to puree ingredients. But, overall, I have tried to preserve the traditional ingredients and techniques as much as possible, preferring to hand-shred ginger and vegetables rather than feed them through a food processor. The recipes reflect the range of mastery of the Cantonese home cook. The rich flavors of home-style cooking include basic stir-fry recipes, steamed recipes, rice dishes, braises, and soups; my family cooked these on most weeknights. Also included are the auspicious and more elaborate foods connected with New Year's and special occasions. Some of these recipes have an old-world quality about them, reflecting an era when people had more time to cook. Finally, the healing remedies are intended to restore harmony and strength to the body for proper yin-yang balance. My parents' approach to cooking is Zen-like: attentive to detail and masterful. They are not formally trained in cooking, yet they share a passion for food that is common among many Chinese. They have great esteem for the meaning and symbolism of food as well as respect for age-old remedies. The everyday rituals of properly selecting produce, slicing meat, washing rice, and presenting a meal, which I have inherited from my family, have given me an aesthetic insight into life. The slow emergence of these truths has allowed me to see the meaning of my own cooking as a metaphor for life. 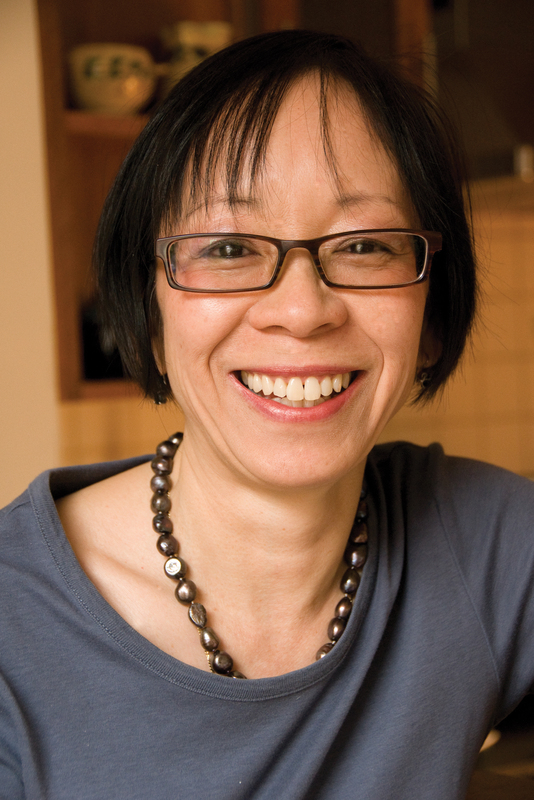 Grace Young is an award-winning food writer and the author of Stir-Frying to the Sky’s Edge, The Wisdom of the Chinese Kitchen and The Breath of a Wok. Her work has appeared in Gourmet, Metropolitan Home, Copia, Gastronomica, Eating Well, More, Fitness, Home, and Health magazine. For seventeen years, Young was the Test Kitchen Director and Director for Food Photography for over forty cookbooks published by Time-Life Books. She is now a consulting editor at Saveur. Amy Tan A cookbook of family secrets that the Kitchen God's Wife would have been proud to write for her daughter. Ken Hom author of Easy Family Recipes from a Chinese-American Childhood Grace Young's The Wisdom of the Chinese Kitchen is a poignant, touching look at her Chinese-American past. Each page is filled with delicious recipes written straight from the heart. This is more than a cookbook; it is a social history that deserves a place in every American library. Paula Wolfert author of Mediterranean Grains and Greens It's so rare to come across a cookbook that I fall in love with at first sight. I heartily recommend The Wisdom of the Chinese Kitchen for its terrific recipes, intimate view of how Chinese-Americans eat, and charming writing. The sections on yin-yang harmony and shopping like a sleuth are worth the price alone!